Rent the new Dodge Caravan for your vacation to the Hawaiian Islands. Enjoy this 4-door mini-van with room for 7 passengers. This van sports a sleek exterior and lots of room for storage inside also. The common mileage for the Dodge Caravan is 19 miles per gallon. Like all of our rentals, this van has a six-speed automatic transmission, cruise control, tilt steering, rear wipers and antilock brakes, air conditioning, climate control and an auxiliary audio jack. 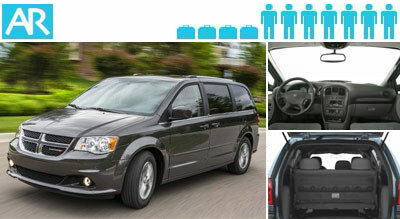 Minivans are excellent for large groups and families. We also offer large full-size vans which can hold up to 15 passengers.